NL4174 Lasercut for precision Patchwork ruler, designed in Australia and lasercut for an accurate and smooth finish •Made from tough durable acrylic •improved, sharper, two colour grid with all essential measurements clearly marked. 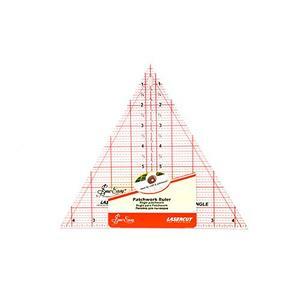 •Quilting Ruler 60 Degree Triangle 8x9-1/4in The perfect ruler for cutting equilateral triangles and diamonds. Very popular for 6 pointed star designs and tumbling blocks. Clear easy to read lines.